Preheat oven to 350 degrees. Line small baking sheet with parchment paper. In large saucepan, preferably wider than deep, place 1 teaspoon of oil. Add lemon slices, and coat with oil. Arrange coated lemon slices on prepared baking sheet. Set pot aside. Roast lemons for 20 minutes, or until rind is golden brown in places. Thin sections of slices may blacken. Coarsely chop 2 lemon slices, then set all roasted lemon aside. Set saucepan over medium-high heat, and add remaining oil. Add rice, stirring to coat grains well. Spread rice to cover bottom of pot, and cook until rice is fragrant and lightly browned in places, then starts to crackle, 5 minutes, stirring rice frequently. Add onions and cook, stirring constantly, until translucent, 3 minutes. Pour in broth, add chopped lemon and bring liquid just to boil. Reduce heat, cover tightly and simmer for 20 minutes. Check to see if liquid is needed, adding 1/2 cup water. Continue cooking, covered, until liquid is absorbed and rice is fluffy but still slightly al dente. Set aside, covered, for 10 minutes. Season to taste with salt and pepper. Fluff pilaf with a fork. 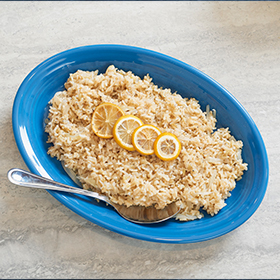 To serve, spoon rice onto platter or into wide serving bowl and top with remaining lemon slices. Serving size: 1/6 recipe. Amount per serving: 150 calories, 3g total fat, (0.5g saturated fat), 27g carbohydrates, 3g protein, 2g dietary fiber, 190mg sodium.